Panic Disorder Might Have an Epigenetic Explanation | What is Epigenetics? Fight-or-flight is a physiological response that occurs when an individual has been exposed to a perceived threat. This well-known stress response pathway is critical for the survival of many organisms. However, people with different types of anxiety-driven disorders can experience intense stress even with little to no stimuli. For individuals who suffer from anxiety disorders, the feeling of worry and anxiety do not go away. The recurring waves of fear that set off a fight-or-flight response may interfere with daily activities and relationships. A better understanding of the mechanisms that cause anxiety and the various kinds is necessary to help those who suffer from these types of disorders. Interestingly, epigenetics has been recently investigated as a potential underlying influence. According to the NIH, people with generalized anxiety disorder experience excessive anxiety or worry for several months and endure numerous symptoms including irritability, muscle tension, difficulty controlling worrisome thoughts, and restlessness. For those with social anxiety disorder, their anxiety and thoughts of worry are focused more on the social environment, including how they are perceived by others and avoiding places where there are others. Panic disorder, however, is characterized by recurrent unexpected panic attacks. These are sudden periods of intense and gripping fear and can include heart palpitations, shortness of breath, dizziness, and a feeling of impending doom. According to the Anxiety and Depression Association of America, anxiety disorders affect 40 million adults in the United States age 18 and older, and panic disorders affect 6 million. 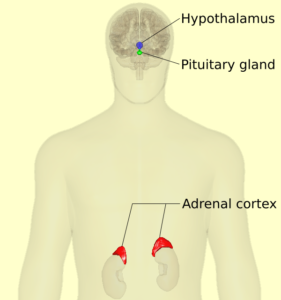 The Hypothalamic–pituitary–adrenal (HPA) axis is a complex set of direct influences and feedback interactions involving three endocrine glands. A recent study performed by Christoph Schartner from University of Wuerzburg in Germany suggests that many anxiety disorders may be regulated by changes of gene expression of corticotropin releasing hormone receptor 1 (CRHR1) to different situations. CRHR1 is involved in the hypothalamic-pituitary-adrenal (HPA) axis, a feedback loop comprised of the hypothalamus, pituitary gland and adrenal gland. The HPA axis is critical in regulating the body’s response to stress. During stressful situations, CRHR1 binds to corticotropin-releasing hormone (CRH). CRH and vasopressin cause the release of adrenocorticotropic hormone (ACTH), from the anterior pituitary gland. ACTH is then released into the bloodstream where it reaches the adrenal cortex and stimulates the synthesis and secretion of cortisol and other glucocorticoid steroids. When a panic attack occurs, individuals experience sudden periods of fear that include physical changes such as accelerated heart rate, sweating, shaking, palpitations, and shortness of breath. Many of the physiological symptoms that occur are due to the secretion of cortisol from the adrenal glands. By observing changes in gene expression or methylation patterns of CRHR1, we may better understanding of the regulation of the HPA axis and why this anxiety disorder occurs. Data from previous studies demonstrate a decrease in anxiety-like behavior in mice that have Crhr1 knocked out. Research has also shown that DNA methyltransferase, DNMT3A, could potentially be used as a novel epigenetic treatment for disorders related to anxiety and that histone deacetylation might influence anxiety and depression. The researchers in the current study focused on the DNA methylation pattern of the CRHR1 gene. DNA from patients diagnosed with panic disorder was isolated, treated with sodium bisulfite and compared to DNA isolated from healthy patients. Those with panic disorders were found to have a significant decrease in CRHR1 methylation when compared to their healthy counterparts. These findings suggest that CRHR1 hypomethylation leads to an increase in CRHR1 mRNA expression which, in unison, results in increased anxiety-like behavior. These data further corroborates the finding from the knockout mice study, which also saw a decrease in CRHR1 expression. This study provides an insight into the epigenetics that may play a role in anxiety disorders, in particular panic disorders. We may use this data to test individuals and determine if they are predisposed to anxiety disorders. It has been shown that this disorder runs in families, therefore, individuals may be tested for these specific methylation patterns on the CRHR1 promoter region, resulting in early detection and treatment before the disorder interferes with their daily activities. It may also be possible, with all the advances in genome editing tools, that in the future we could modify the methylation pattern of the CRHR1 gene. Source: Schartner et al. CRHR1 promoter region hypomethylation: An epigenetic readout of panic disorder? European Neuropsychopharmacology. 2017. 27, p360-371.